A continuation of the list of fall perennials. Patrinia villosa, patrinia, Zones 5-8. 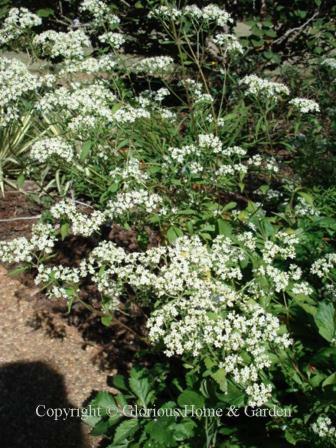 Patrinia has tiny white flowers that float above the foliage giving a lacy effect to the border. A nice plant to interweave with others. 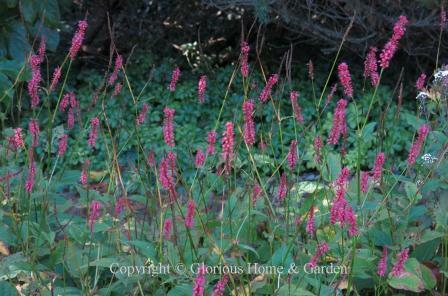 Persicaria amplexicaulis, mountain fleece, Zones 4-7. This plant caught my eye when I spotted it recently at the Berkshire Botanical Garden in Stockbridge, MA because I haven't seen it growing in the Atlanta area. It really stood out against a dark background with its little bottle-brushes of crimson flowers rising above a sea of green leaves. Long bloom period. Phlox paniculata, garden phlox, Zones 4-8. Phlox paniculata is certainly of one of the mainstays of the summer garden, but it will often continuing blooming into fall. 'Jeana,' lavender-pink and mildew resistant, and 'World Peace,' white, are a couple of late season bloomers. 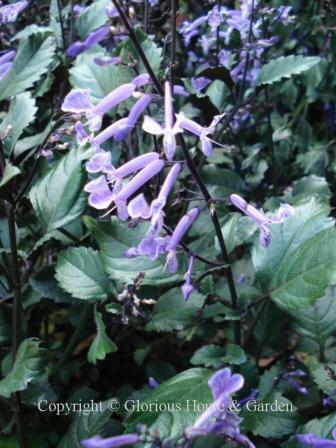 Plectranthus 'Mona Lavender', Swedish ivy, Zones 10-11. The dark green leaves with purple undersides are attractive, and the tubular lavender flowers are lovely and bloom over a long period in summer, but they bloom more profusely and the color seems to intensify with the approach of cooler weather. Best grown as a houseplant, in containers or as a summer bedding plant north of Zone 10. I overwinter mine in the garage and bring them back out in spring after danger of frost is past. Ricinus communis, castor bean, Zones 8-11. 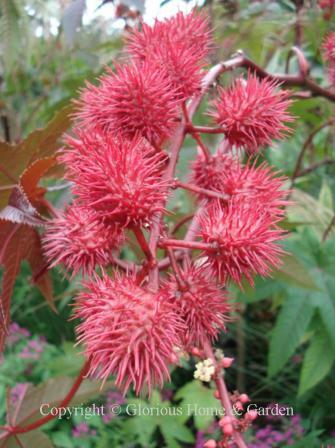 Castor oil is derived from the seeds of this plant which can grow to a small tree in frost-free zones, but is usually used as an annual. As a fall curiosity, it can be highly ornamental with huge tropical looking palmate leaves and interesting prickly seed pods. There are some named cultivars that are particularly ornamental. However, all parts of this plant are highly toxic (especially the seeds) and should not be planted where there are children about. Rudbeckia nitida 'Herbstsonne', shining coneflower, Zones 5-9. This tall (5-7') late summer into fall perennial has golden yellow slightly drooping petals surrounding a raised green dome-shaped center. Planted at the back of the border with other tall fall stars like Joe Pye Weed and asters, 'Herbstsonne' is a standout. 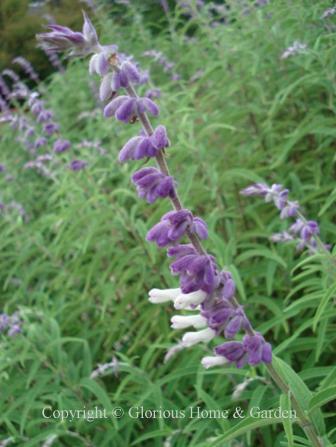 There are so many great salvias to choose from, one could use them as the foundation plants for a great perennial border and have blooms from spring to frost. 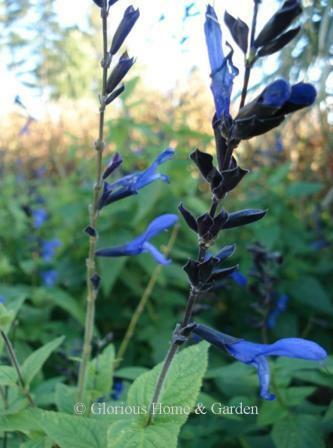 Salvia azurea var. grandiflora, azure or prairie sage, Zones 5-9. This North American native has the benefit of being a fall-blooming perennial, but most of all it has the most glorious blue flowers! Drought tolerant. Salvia elegans, pineapple sage, Zones 7-10. A delightful fall perennial on many levels--the crushed leaves really do smell like pineapple, and the red tubular flowers bloom late in the season and continue until stopped by frost attracting any late bees and butterflies. It is beloved by hummingbirds. In my Zone 7b garden it dies to the ground in winter and reappears in spring, north of Zone 7 it may be killed by frost before it can bloom. Salvia greggii, Texas or autumn sage, Zones 7-10. 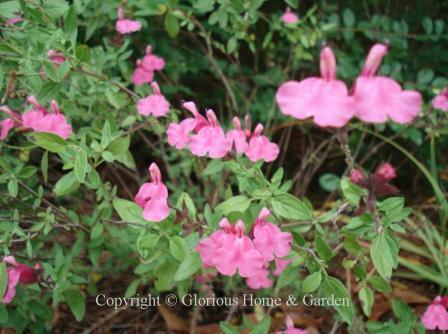 This shrubby sage grown 2-3' and blooms over a long period from spring to fall and are drought tolerant. I love the "HeatWave" series (said to be a cross between S. greggii and S. microphylla) for its long bloom period and clear colors. 'Heat Wave Scorcher' shown below. Salvia guaranitica, blue anise sage, Zones 7-10. 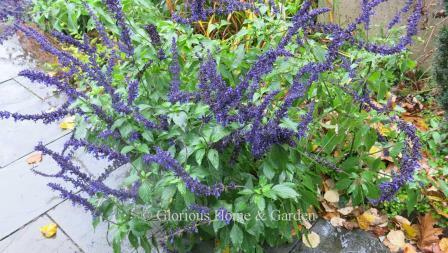 One of my favorite fall perennials, fall or otherwise, blue anise sage blooms from late spring into fall. 'Black and Blue' is an excellent cultivar with outstanding blue flowers and deeper blue, nearly black, calyxes. This subshrub can get huge--as much as 6' tall--and blooms through summer into autumn. × 'Indigo Spires,' Zones 7b-10. 'Indigo Spires' is a fantastic hybrid, very vigorous, and reaching about 4' in height. The long blooming period (summer to frost) is one of its most appreciated traits, and the intense violet-blue of the flowers on long, twisting, spike-like inflorescences are very showy and really make in impact in the garden. Pinch off spent flower spikes to keep it tidy and blooming away. One of my favorites! Salvia leucantha, velvet sage or Mexican bush sage, Zones 7b-10. 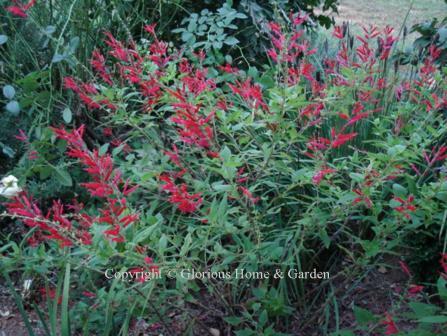 Mexican bush sage is treated as a tender perennial or annual in most areas. It flowers profusely from early summer until stopped by frost, producing many spikes of velvety white flowers extending from a lavender calyx. The narrow gray-green leaves are soft as well. Easy to grow in full sun and drought-tolerant. Salvia uliginosa, bog sage, Zones 6-9. Bog sage produces beautiful sky blue flowers on 3-6' plants from summer until frost on 3-6' plants. Growing in wet places in its native habitat, bog sage does well in ordinary well-drained garden soil in light shade--sometimes too well--the plant spreads by underground runners and can become invasive. Salvia splendens 'Van Houttei,' wine sage, Zones 8-10. Lovely burgundy flowers from summer into fall. A tender perennial that can be treated as an annual outside of its range, or cuttings can be taken to overwinter in a greenhouse. 'Paul,' shown below, is a deep wine cultivar. 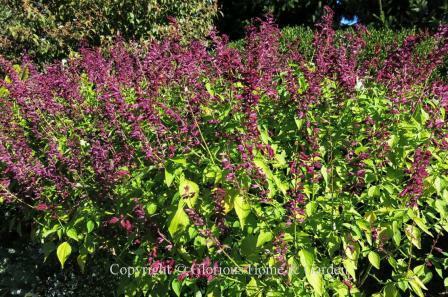 Works well with Agastache rupestris 'Tutti Frutti' and fall-blooming ageratums. Sedum × hybrida, stonecrop hybrids, Zones 3-8. 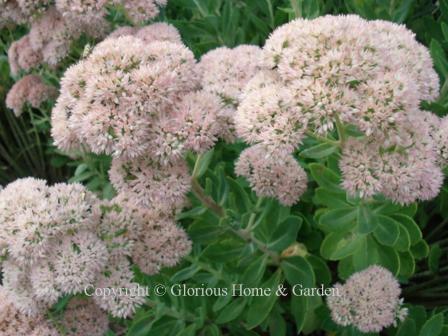 Sedums are wonderful fall perennials with their rounded flowerheads and fleshy succulent leaves--bees and butterflies love them. There are several outstanding cultivars. 'Autumn Joy' (pictured) is a cornerstone of the fall border. The flowers change color from palest pink to rose and finally copper-red as they mature--they sort of look like pink broccoli. 'Autumn Fire' is a newer cultivar with deeper colored rosy flowers than 'Autumn Joy' that last longer into the fall. 'Matrona' has dark wine red stems and blue-green leaves with a hint of purple. The pink flowerheads are borne above the foliage on tall stems. An outstanding color combination. Solidago × hybrida, goldenrod hybrids, Zones 4-9. 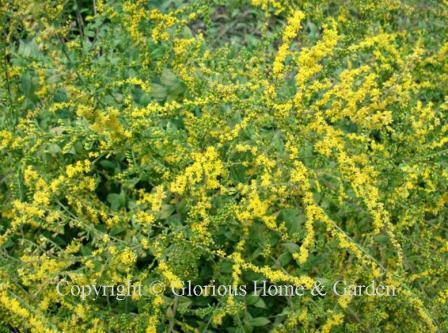 While goldenrods are a common roadside wildflower in North America in late summer and fall, we haven't been too keen to use it in our gardens. Probably because most of them grow quite tall and look sort of, well, weedy when not in bloom. They also have the undeserved reputation for causing hayfever (actually ragweed). But in the wild they can make spectacular displays with their showy golden yellow plumes. Cultivars are being developed that make this native wildflower more manageable and refined for our gardens. S. sphacelata 'Golden Fleece' is a dwarf (15-20"), 'Crown of Rays' grows 2' tall and has thick feathery plumes, 'Little Lemon' grows compactly to 12-18" with lemon yellow flowers, and S. rugosa 'Fireworks' grows to 3' and will light up your garden with long arching sprays of gold. Do include one of more of these outstanding fall perennials in your garden. Symphyotrichum oblongifolium, aromatic aster, Zones 5-9. 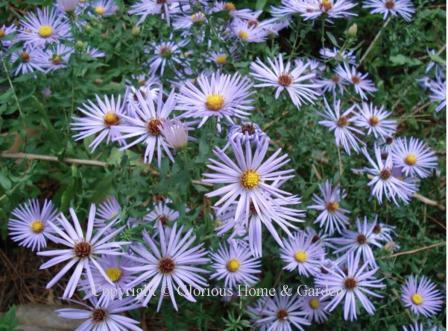 This aster relative has gotten a lot of attention lately for its beautiful blue-with-a-hint-of-lavender flowers with yellow centers that bloom profusely in autumn. The foliage is aromatic when crushed. Unlike the tall asters, this one is low-growing and spreads by rhizomes to form a large clump. 'October Skies' and 'Raydon's Favorite are good cultivars of this North American native wildflower. 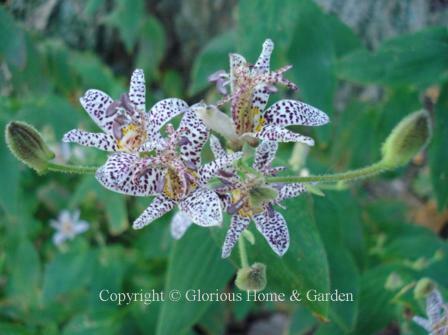 Tricyrtis hirta, toad lily, Zones 4-8. Toad lilies are delightful in the late summer and fall shade garden--and they are certainly more beautiful than their common name. T. hirta produces lilac flowers in the leaf axils on long arching stems from late summer to mid fall. 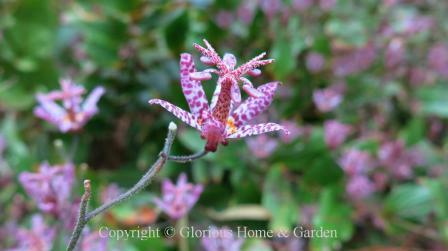 Tricyrtis formosana, toad lily, Zones 5-8. This one holds it's speckled flowers on the ends of long stems as well as in the leaf axils. Lovely fall perennials for the shady garden! Tricyrtis macropoda, toad lily, Zones 5-8. 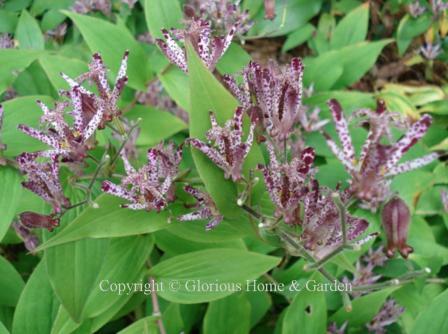 Toad lilies are wonderful plants for autumn flowers in a shady, moist garden. T. macropoda has an upright growth habit that shows off the flowers well. 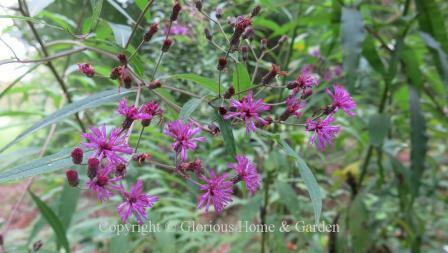 Vernonia noveboracensis, New York ironweed, Zones 5-8. This is a tall (3-7') plant that does well in the back of the border in full sun. The purple flowers bloom in late August to September and combine well with the yellows of goldenrod and helianthus. Copyright © 2019. Glorious Home & Garden. All rights reserved. Powered by Solo Build It.